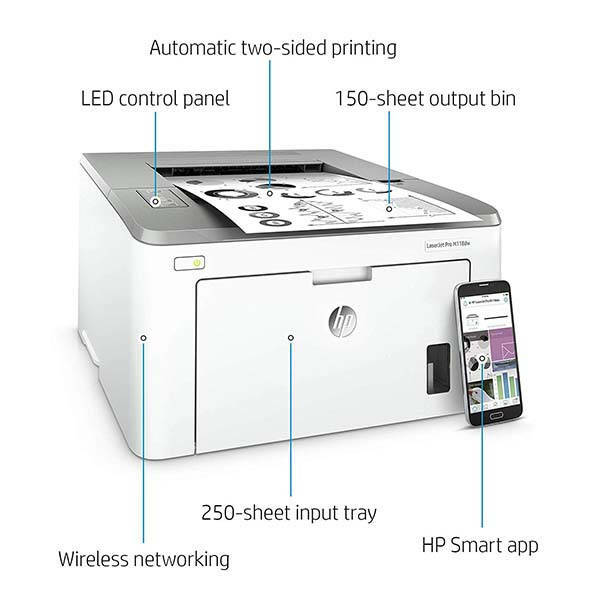 Using WiFi connectivity, HP Laserjet Pro M118dw wireless monochrome laser printer conveniently prints content from your computers and mobile devices at home, and it supports auto two-sided printing. Need more features? Let’s keep checking. The Laserjet Pro M118dw is a budget-friendly and versatile wireless laser printer that measures 14.6 x 16 x 8.8 inches and weighs 15 lbs. As shown in the images, the printer boasts a sleek, cubic form factor with a discreet white-and-gray exterior so that it can decently stays on your desk, and built WiFi connectivity lets you more flexibly deploy the printer in your house without having to stay close to your computer. The wireless laser printer comes equipped with a 250-sheet input tray and it delivers print speeds of up to 30 pages a minute. Furthermore, its auto two-sided printing provides higher productivity. Using its companion app, the printer can print from the cloud such as iCloud, Google Drive and Dropbox, and you can also use the app to scan from smartphone or tablet. Moreover, the replaceable imaging drum can last up to 23,000 black and white pages. The wireless laser printer also works with Amazon Alexa, Google Assistant and Microsoft Cortana so you can remotely control it with your voice. In addition, it comes with Ethernet cable and USB cable for wired connection. 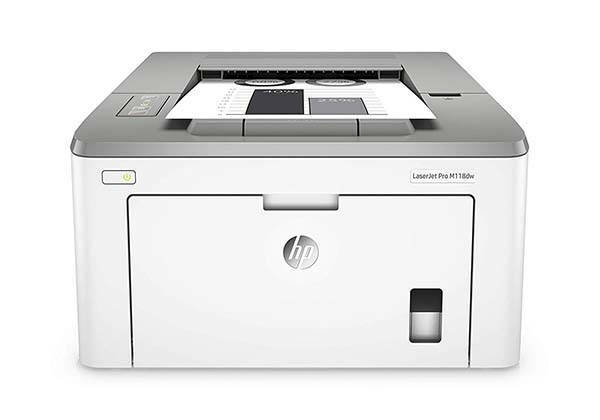 HP Laserjet Pro M118dw wireless monochrome laser printer is priced at $99 USD. If you’re interested, jump to the product page for its more details.